Alexander Wang (born December 26, 1983) is an American male fashion designer. Wang is known for his urban designs. After designing a Fall 2008 collection using black as the predominant color, he designed his Spring 2009 collection using bright colors such as orange, dusty purple, aqua and hot pink. In the meantime he has reverted to using mainly black fabrics, and is often praised for exhibiting outstanding tailoring skills. On July 31, 2015, it was announced that Alexander Wang would leave Balenciaga. Wang was born in San Francisco, California, to Taiwanese parents. He has a brother named Dennis. At 15 years old, Alexander Wang went to a summer design program at Central Saint Martins. Wang attended elementary and middle school at the Harker School. He went to boarding school in Pebble Beach, CA at Stevenson School for 9th grade. During the latter part of his teenage years, he lived in San Francisco and attended the Drew School for high school. In 2005, after two years at Parsons, he decided to pursue the launch of his own fashion label, which predominantly began with a knitwear collection. In Fall 2007, Wang presented a complete women’s ready-to-wear collection on the New York catwalk for the first time, to critical acclaim. He won the CFDA/Vogue Fashion Fund in 2008, an honor accompanied by a $20,000 award to expand one's business. That same year, he launched his first handbag collection. In 2009, women’s T by Alexander Wang was launched, followed by Men’s T by Alexander Wang a year later. In 2009 he was recognized by his peers when he was announced as the winner of the CFDA’s Swarovski Womenswear Designer of the Year Award. Also in 2009, Wang was the recipient of the Swiss Textiles Award. His lines are now stocked globally in more than 700 stores and other venues; including, luxury department stores such as, Bloomingdale's, Barneys New York, Neiman Marcus, Bergdorf Goodman, Dover Street Market, Browns, Saks Fifth Avenue and Net-a-Porter. Wang launched his full women’s collection in 2007; the collections are selling to over 700 stores worldwide, and the brand has 16 stores in 7 countries. He was the winner of the 2008 Council of Fashion Designers of America (CFDA)/Vogue Fashion Fund Award. In the November 2010 issue of Vogue in remembrance of winning the award in 2008, in an article entitled "The Aluminati". In 2009, he was recognized by his peers when he was announced as the winner of the Swarovski Womenswear Designer of the Year and in October 2009, he was the recipient of the Swiss Textiles Award. Wang was celebrated again in 2010 with another Swarovski Designer of the Year Award, this time in the Accessory category. In 2011, GQ US acknowledged Wang as the Best Menswear Designer of the Year. The same year he also won the CFDA’ s Best Accessory Designer award. In October 2013, Wang was honored with the ‘Fashion Star’ awarded by Fashion Group International. The award was presented to Wang by Hamish Bowles, European Editor-at-Large of Vogue US. Alexander Wang's first flagship store opened in SoHo, Lower Manhattan, on February 17, 2011. Wang has helped to rejuvenate an otherwise dissolving area into fashion's Lower Manhattan epicenter. On November 30, 2012, Women's Wear Daily reported that Wang has been named Creative Director at Balenciaga after Nicolas Ghesquière departed from the French house. “As Creative Director for Balenciaga, Alexander Wang oversees the Women’s and Men’s ready-to-wear and accessories lines. His debut Fall-Winter 2013 Balenciaga collection took place in February 2013, at the historic Balenciaga salons located at 10 avenue George V, Paris, 75008. On July 31, 2015, Kering issued a press release announcing that Wang will leave Balenciaga by mutual consent. On April 13, 2014 it was announced that Alexander Wang would be the next designer to create a collection for Swedish-based fashion retailer H&M. The collection was available at H&M stores and online November 6, 2014. The collection with H&M included pieces for both men and women, as well as a selection of his famed accessories. The news was unveiled via the designer’s personal Instagram page. In 2016, Wang became the CEO and chairman of the Wang brand, succeeding his mother, Ying Wang, and sister-in-law, Aimee Wang.. Later that year, he was awarded $90 million in damages after successfully suing over 45 defendants operating 459 websites that sold counterfeit goods bearing its name, although the reward is mostly symbolic, as neither Wang nor the brand will likely receive that amount. Wang hosted a 2016 New York Fashion Week show. In 2017, Wang was named one of HypeBeast's HB100, their top 100 influencers in the industry. On March 5, 2012 the New York Post reported a $50 million lawsuit against Wang for running a sweatshop in Chinatown, Manhattan. The article states that roughly 30 workers have complained about the labor conditions Wang provides. One of the workers, Wenyu Lu claims that he was "hospitalized for several days after he passed out at his work station because he was forced to work 25 hours straight without a break". Lu claims that the 200 square foot office on Broadway is windowless and poorly ventilated and that workers have been forced to work 16 hours or more without overtime or breaks. The former worker's lawyer, Ming Hai, claims that Lu was eventually fired on February 16 due to complaints about working conditions and applying for workers' compensation. According to Women's Wear Daily the plaintiffs involved in the suit are asking for $50 million per charge, adding up to $450 million for the 9 charges in total. On August 14, 2012 WWD reported ‘Alexander Wang Lawsuit Dismissed’. According to WWD – "New York federal court Judge Harold Baer on Monday dismissed the suit brought against the company by two former employees". “We are gratified that this matter has been dismissed, as the allegations were unfounded and completely false”, a spokesman for Wang told WWD. ^ "Biography - Alexander Wang". Alexanderwang.com. Archived from the original on March 25, 2012. Retrieved March 27, 2012. ^ "Alexander Wang Named Balenciaga Creative Director". Vogue.uk.com. Retrieved November 30, 2012. ^ "Alexander Wang Fall 2008 Ready-to-Wear Collection". Style.com. Archived from the original on May 10, 2012. Retrieved March 27, 2012. ^ Mistry, Meenal (September 6, 2008). "Alexander Wang Spring 2009 Ready-to-Wear Collection". Style.com. Archived from the original on March 12, 2012. Retrieved March 27, 2012. ^ Mistry, Meenal (February 14, 2009). "Alexander Wang Fall 2009 Ready-to-Wear Collection". Style.com. Archived from the original on March 12, 2012. Retrieved March 27, 2012. ^ "Stevenson School: Back Porch 2013.02: Courage". Archived from the original on 2016-03-05. Retrieved 2013-11-13. ^ "Designer Alexander Wang shares pride at his immigrant roots". South China Morning Post. 2018-06-04. Retrieved 2018-12-14. ^ DFCultures (2016-11-07). "Alexander Wang | Taiwanese-American". Defining Cultures. Retrieved 2018-12-14. ^ "7 Taiwanese and Taiwanese Americans Who Are Defining the World of Fashion". City543. Retrieved 2018-12-14. ^ Sanchez, Karizza. "10 Things You Didn't Know About Alexander Wang". Complex. Retrieved 22 December 2016. ^ "Alumnus Wang Named to Forbes 30 Under 30: Art & Design for Award-Winning Lifestyle Brand". Retrieved December 20, 2011. ^ a b "Alexander Wang - Designer Fashion Label". New York Magazine. Retrieved March 27, 2012. ^ "Alexander Wang wins 2009 Swiss Textiles Award". The Independent. London. November 13, 2009. Retrieved 7 November 2014. ^ Grinspan, Izzy (February 14, 2011). "Alexander Wang's Soho Store Opens This Thursday, February 17". Racked NY. ^ Wilson, Cintra (March 1, 2011). "Alexander Wang's Store Opens in SoHo". The New York Times. ^ Adams, Esther. "Alexander Wang Resort 2012". Vogue. ^ Socha, Miles. "Alexander Wang to Take Reins at Balenciaga". WWD. ^ "Alexander Wang For H&M - New Collection Collaboration (Vogue.co.uk)". Vogue UK. 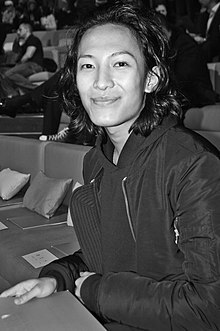 ^ "Alexander Wang's Bittersweet Legal Award (Vogue.co.uk)". Vogue UK. ^ Smith, Trevor (September 11, 2016). "Tinashe, MetroBoomin, Big Sean, and Tyga headline fashion show". Hotnewhiphop. Retrieved September 11, 2016. ^ "HB100 2017 | HYPEBEAST". HYPEBEAST. Retrieved 2018-02-06. ^ a b Carrega, Christina (March 5, 2012). "$50M suit alleges designer Alexander Wang runs Chinatown sweatshop". nypost.com. Retrieved 26 March 2012. ^ Cowles, Charlotte. "Alexander Wang Sued for Running Alleged 'Sweatshop' in Chinatown". nymag.com. Retrieved 26 March 2012. ^ Pinson, Laurel. "Update: Alexander Wang Denies '"Sweatshop" Lawsuit Allegations". nbcnewyork.com. Retrieved 26 March 2012. ^ "Alexander Wang Lawsuit Settled, Dismissed Quietly". huffingtonpost.com. Retrieved 29 April 2016. Wikimedia Commons has media related to Alexander Wang.